Ummm......it IS mid-April, is it not? I noticed that exactly one month ago, I had a similarly startled post to the ferocious non-springlike weather. 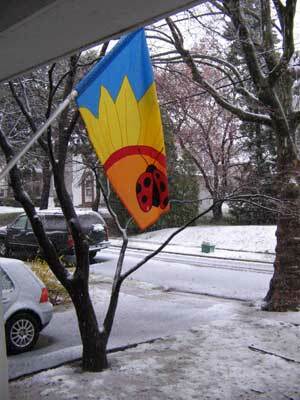 The nor'-easter brought SNOW today. Snow. Okay, I admit that I'll be the first one to whine about it being too hot, but c'mon. So, enough complaining about the weather, which is boring. I notice that my neighbors parked a different car in front of their house, but the Phillies were rained out so I don't know how that would have affected them. Yes, it is just a chocolate cake, but more importantly it is a chocolate cake (and icing!) made from scratch. I never did that before. On Sunday, Matthew expressed a desire for chocolate cake and asked when I was going to get in the car (remember, this was the day that it was raining and I never got out of my pajamas) to drive to the bakery and get a chocolate cake. I said that was never going to happen, but I thought I could make one. 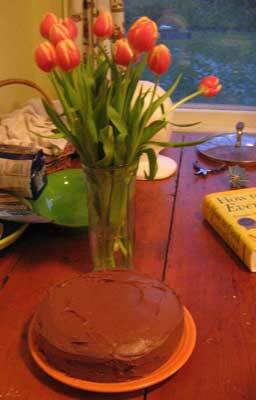 So I whipped out trusty Mark Bittman's "How to Cook Everything" [THANK YOU, LISA] and by jove, he had a recipe and I had the ingredients, so between the two of us we managed to whip up a dandy cake. Bittman always says things like [I'm paraphrasing], "Americans must be sadly alienated from their kitchens to think cake from a box mix is easier than a cake from scratch." Welllllll, honestly I think it's A LOT easier to make a cake from a box mix, but it really wasn't that hard to make one from scratch. Anyway, I adore Mark Bittman; he never lets me down. 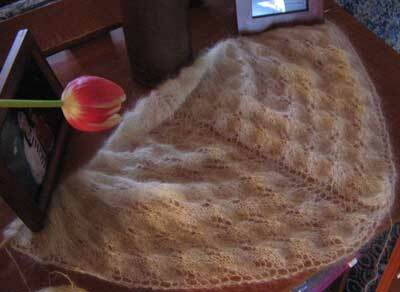 I have completed 9 out of 15 repeats of the Fir Cone pattern at the top of the shawl. Fir Cone is an old friend from the Shetland Shawl from "Wrap Style" that we did as a Knit-Along at the Tangled Web last year. It is soothing in the way the motifs line up on top of each other; it also keeps you from getting too off the track. And the Douceur et Soie is still a dream. how was the cake? Yummy and chocolatey, I'll bet!